For most people, retirement means living in a nice house with a beautiful garden or sea view. But for this couple from Shenyang, China, retirement meant a time to fulfil their dream. And their dream is to see 100 countries in five years. But with only 100,000 yuan (S$20,000) in savings, Mr Lee Lin Xiang, 66 and his wife, Madam Zhuo Ya Fan, 62, who are now in Singapore, felt that it could become just a pipe dream. Mr Lee said in Mandarin: "We were factory workers and we do not have much savings. It is impossible for us to travel around the world by plane. So we had to think of a cheaper alternative to achieve our dream." Madam Zhuo said they are big recycling fans. So they came up with the idea of building a solar-powered trishaw, to take them around the world. "At the same time, we can also spread the message on the need to protect our environment," Madam Zhuo added. The couple, who retired in 1997, spent a year building the trishaw, which cost 20,000 yuan. They used mostly recycled materials like plastic bottles for the wheels’ fenders and rubber from tyres to build their seats. Madam Zhuo said that it was the solar board on the roof of the trishaw and the rechargeable batteries that cost the most. 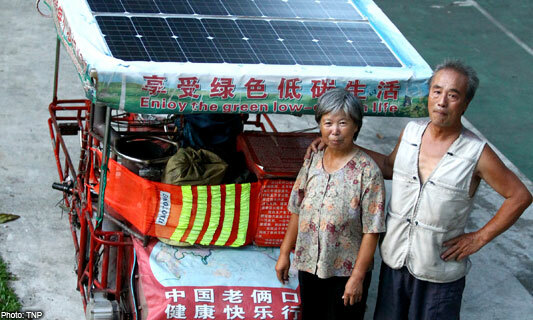 The solar-powered trishaw is able to travel at 17kmh. The solar energy also helps to light up the front and rear lights of the trishaw at night. Madam Zhuo said they also use the solar energy to charge their mobile phones and camera batteries. On Aug 25 last year, the couple, who have a 38-year-old son and a 12-year-old grandson, set off to achieve their dream. They left their hometown in Shenyang, in China’s north-east, and travelled south. First stop, Myanmar. Then Vietnam, Cambodia, Thailand and Malaysia. On Tuesday night, they arrived in Singapore via the Woodlands Checkpoint. The couple said that their son is supportive of their dream. They send him an SMS whenever they arrive at a different country. Mr Lim said: "As we speak only Mandarin, we were afraid that people would not be able to understand us and we would have problems with immigration authorities. "We were also warned that a certain stretch of road in Malaysia can be quite dangerous to travel." But it turned out that the couple’s fears were unfounded. Mr Lim said: "We did not have any problems at the customs of the various countries that we have been to so far. "People gave us curious stares. They were fascinated by our trishaw. "When we told the customs officers about our mission to see the world and spread the environment-friendly message, we were given a warm welcome and had no problems passing the borders. "Some of the officers even gave us drinks and food, and advice on the laws of their countries." Madam Zhuo said: "We had written the purpose of our travel in Chinese and English. Everywhere we go, we ask the authorities to help us translate that into their languages." Singapore is the sixth country they have visited and they have already spent 10 per cent of their savings. "Our money is mostly spent on visa applications, as everywhere we go, people gave us food and money," said Mr Lim. But it is all worth it, he added. He said: "It is our first time to Singapore and we are so impressed at how modern and advanced the country is. "We have been to Little India, Marina Bay Sands, and we have also seen the Merlion. Being Chinese, we are very proud of Singapore’s achievements. "People here are so friendly and helpful. We have been getting free meals and donations from passers-by who learnt of our dream." The couple plans to stay here for 10 days before heading back to Thailand and moving on to India. For the past few nights, they have been spending their nights in sleeping bags at Hong Lim Park. A retiree who wanted to be known only as Mr Liang, 67, was teary-eyed when he bought food for them. He told the couple that he was touched by how they are fulfilling their dreams together. Handing the couple a $50 note, Mr Liang said: "Please accept this. I really admire you both for fulfilling your dreams."